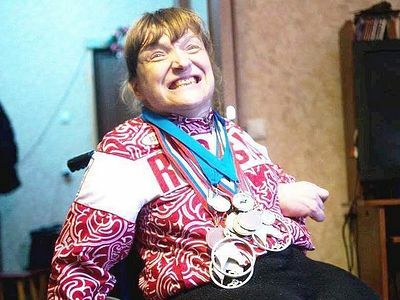 The Paralympic champion Xenia Ryabova who has been on a wheelchair since her birth speaks about faith, hope, and love in her life. When it comes to happiness, everyone understands it in different ways. For some, happiness means money, for others it is family and children, for others it is love. In my opinion, happiness is when people need you, miss you when you’re away and are glad to be with you. It is about being needed by the world and interesting to people. It is when the world is attracted to you and vice versa. People need me: I have a beloved husband, kids, friends and relatives who love me. I have favorite activities, namely riding, drawing and writing articles. The rest will take care of itself. What really matters is feeling needed. That is all. I would like to thank the Almighty for loving me. Unfortunately, I cannot go to church because I am heavily handicapped. But I always turn to God in my prayers. I shut myself up in my room and just speak to God for hours and I do feel that He hears me. There are two things I ask God for above all: to give health and strength to my husband Constantine and our son Yasha [a diminutive form of the name James/Yakov in Russian]. To be more exact, I especially ask for three things; the third request is that we could live together with our kids. We both miss them so much. You can’t find right words to describe love. You just feel it. It is like air in the sense that you feel its presence but cannot see it. Kostya [a diminutive form of the name Constantine in Russian] and I sincerely love each other and never conceal anything. We help each other and never hold a grudge against each other. This year we are celebrating ten years of our marriage and the fourth anniversary since our wedding ceremony at Church. We have gone through so many trials over these years: serious maladies (even life-threatening ones), financial problems and so on. But the most important thing is that we have survived and we are together. We understand each other without words and “read” each other’s minds. We are like two halves of one whole and are unable to exist without each other. During competitions I feel his strong support and feel shielded by him. Whenever he has problems, I can’t sleep at nights trying to solve them. I believe that trials and tribulations are sent by God so that families could overcome them together and become stronger. All difficulties are surmountable; but it is important not to give up and to hope for the better. All of us should respect and understand one another. We must help our better halves rather than try to “reform” them or put them under our dominance. We can preserve our love only through faith, mutual understanding, hope for the better and self-sacrifice for our beloved ones’ sake. This is how we were brought up and it cannot be changed. Perhaps that is why we are happy! We don’t know how long we are going to live, but we will keep thanking God for every moment we are together. Sometimes children are born gravely sick or become disabled afterwards. That is a real trial for their parents. But I am of the opinion that every time it is the work of Divine providence. I believe these ordeals teach parents humility and motivate them to do what they are expected to do: to treat, educate and bring up their children properly. A disability acquired by a child as a result of his illness is God’s proving them in this world, and our society becomes kinder through supporting such children. God allows these things to happen as He wants us to remain human beings. Every time hardships have a Divine purpose in our lives, and it is important for us to discern why they happen. We have a daughter named Caroline and a son, Yashka; they are eight and seven years old respectively. But since there is a risk that childcare agencies and the town council of Troitsk may take our children away from us, they are currently not living with us. The authorities of the town to which I have been bringing fame for ten years by taking part in the Moscow regional, Russian national and international competitions on its behalf, deemed it reasonable to take our children to a children’s home because “it is unsafe for a child to grow up with a disabled parent” instead of providing adequate accommodation and employment to my husband and me. Meanwhile, I know examples of disabled families where parents with CP raise their children independently, manage to cope well, and face no opposition. So we sent our kids to stay with their grandmother for the time being. We are doing our best to support them, and as soon as the situation improves we will take them back. Caroline is a healthy and beautiful girl. This is because I spent my first pregnancy at Kostya’s when he was writing his thesis and where nobody could disturb me. My daughter is a “nose-in-the-air”. Now she is a second-grader at school and her favorite subject is math. Unfortunately, she is still not good at writing, but we hope she will do better in time. She likes smart clothes, as all girls do. Caroline is baptized and her Orthodox name is Vasilisa. She is a moderately spoiled child, rather curious and sociable. She is fond of animals and dreams of owning a dog. Yashka is different. Due to some complications during my second pregnancy and the extraordinarily thick and acrid smoke from wild fires that blanketed Moscow in the summer of 2010, when representatives of childcare agencies visited us twice a week through the season, he has had some health issues. This boy understands everything, is a little lazy and rather clever. My mother-in-law devotes most of her time to him, takes him to lessons and massage. She wants him to walk unaided and do many things on his own. His elder sister has been helping him. Last year he began to walk with his legs and recently he started to feed himself. These are our little victories—the first fruits of training classes with dogs that appeared four years ago in Karaganda [Kazakhstan] and boost small children’s development. This year my mother-in-law plans to visit us for a couple of months for her little grandson’s thorough medical examination, get his diagnosis and register him as disabled, because Yashka is a Russian citizen. We need to have him admitted to Moscow city hospital no. 18, though we have no idea how to get there quickly. My mother-in-law won’t be able to come here for long, as she has her parents, a husband and a flat to look after in Karaganda. And both the medical examination and treatment will require a lot of money. I want my kids to live, to grow up and develop with us. We both want to pass down our knowledge to them, to embrace them and press them to our breasts as soon as possible. But we cannot take our children back until we have a reasonable apartment with a separate room for each of our children and good jobs. Until then the childcare agencies won’t give us a moment’s peace. The above requirements for an apartment are theirs, and it must be our own flat, not a rented accommodation. Only then will they leave us alone! I have a feeling that if we ever get a flat, it will be through my sport activities. In fact we don’t meet any criteria of the current federal programs for young families because I am about forty-five, and my husband is a citizen of Kazakhstan. But if I continue to successfully take part in Russian national and international competitions (and I will), then I may be given a flat with the support of the Moscow Regional Paralympic Committee. However, for this I need to exercise much, get training, take part in local competitions, and all of that depends on finances… The Federation won’t help me until I win in Russian championships and become a member of the Russian Paralympic dressage team. 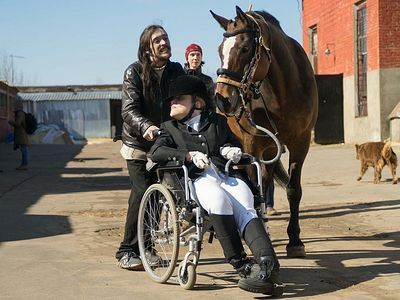 As for sponsors, they don’t believe that a person with a severe form of CP can ride a horse, let alone take part in tournaments. But I exist and I can do this. Not only am I a rider, I also prepared my horse Garik for our successful performances. True, a coach did help me; but believe me, no coach can repeat the movements that I do. Hyperkinetic movements (a characteristic attribute of my condition) simply cannot be repeated. And when I won in December, I began to weep tears of joy. I was proud of my horse, because it was not fearful of a new place, and we succeeded. In February it emerged that my husband faced deportation on account of his problems with the registration, a migration visa and a heavy fine. If he had been deported, he would also have been banned from entering Russia for ten years… It would have been fatal to me. I cannot live without him, neither can I live there in Kazakhstan because the standards don’t meet the needs of wheelchair users there. We urgently had to look for money to pay the fine and that story is not over yet. But I believe things will settle one way or another with the help of God. I hope my children will grow and become good, kind people and will support each other. I also hope that they won’t feel awkward with us and will always accept us for who we are. I wish them to love their motherland, its history, culture, to remember that they are Russian, to be proud of their dad and mom, and to be healthy. With respect to their occupations, they will choose them in due course, and we won’t stand in their way. From the bottom of my heart I would like to thank all those who have helped us. In addition to our basic necessities, we even managed to buy New Year presents for our kids. They were so excited about it and they heartily thank all of you too. Hope you will continue your support until we find jobs and “stand on our own feet”. If you wish to help my family and me, here is my card number (Sberbank of Russia): 4276 8381 3681 9606. You can also contact me in social networks or via email. 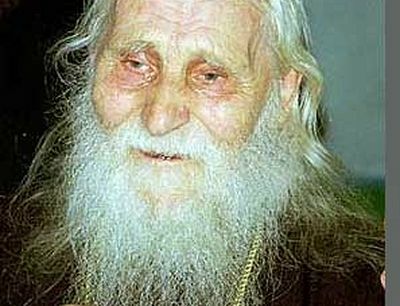 From “And they shall be one flesh"
Once a certain priest went to visit the now reposed elder Archpriest Nicholai Guryanov and told him about the sorrows and problems he was having. Fr. Nicholai heard him out and said, “Rejoice!” “What is there to rejoice about?” The priest thought to himself.